We have received a kind donation of ₤20 from a lady in the UK. This has allowed WEPOGA/MAP to buy a month's supply of maize and sugar for the children porridge, chalk and a board rubber, coloring crayons and pencil sharpeners and, a football for the children to play with. Thank you Mrs Howlett. Children playing with a football donated by a supporter from the UK. We would also like to thank Pam from Wales who generously donated ₤10. Her money is being put towards the next month's supply of nutritious porridge and stationary equipment. We are very grateful to Matt Price of The Arsenal who has made a generous donation of ₤70 that has meant we can treat the whole school for worms! Thank you very much. Our thanks also go to Mr and Mrs Butler in Canada who donated $50CAD towards the Tumaini Academy. We are very greatful for all the support we have received from Canada. Their efforts have meant that the building projects at the school have begun in ernest. Here are the latrines being dug and you can see the new roof of the school in the background. Firstly we would like to thank our German sponsors action five Their generous donation has meant that this month WEPOGA/MAP was able to host a trainer from the Kenya Institute of Organic Farming (KIOF) to present 24 group representatives with the first Training of Trainers seminars (click here to find out more). It has also meant that WEPOGA/MAP is able to buy another acre of land to extend the organic demonstration plots and, to build a permanent seminar building in Shibanze. Our thanks also go to our British donors Rob and Lisa who kindly donated ₤30, to Simon Gray for donating ₤75 and Rich Gregorowski for donating ₤10. We would also like to thank Sister Penny in Wales for her kind donation. All this money is going towards the children's school uniforms and to completeing the construction work at the school. We would like to start the new year off by thanking Angela and Cynthia in Wales for the kind donation of school materials that we have received. Next, WEPOGA/MAP would like to thank Philip Duerdoth in Cyprus for his kind donation which will be used to pay the teachers and other staff at the school. WEPOGA\MAP has experienced a rapid growth in its activities and programs since the month of January. There have been so many advancements recently, making the WEPOGA/MAP organization the best it has ever been. Right after the farmers seminars were completed in December 2006, many of the farmers are now equipped with enough knowledge to begin putting sustainable development and organic farming methods into practice. The farmers have expressed so much appreciation for the seminars. It is our prayer now for the organization to see to it that the farmers are really benefiting from the programs and lessons. We really thank God for Amanda wepoga's Volunteer who has been able to network tirelessly with his parents and friends back at home and they have raised so far $10,000.This funds have been mainly used for improving the school e.g finishing of the two classrooms and an office,Buying a power /energy saving stove,building of the playing ground,Digging of the borehole,Building a good dairy shade for two cows .The most important thing is that now wepoga has bought agood grade cow that is incalf and yet we are still milking around 2 to three ltres of milk everyday!!!!! WEPOGA/MAP's mission is committed to building sustainable farming communities through organic agriculture which is environmentally friendly and is geared towards poverty reduction/curbing food insecurity. Through organic farming, we have established the Academy for children who previously had no access to education. Although a primary education is "free" here in Kenya, in order to be accepted at a school, children must pass an examination. In order to pass this examination, they must have attended a nursery school (nursery or early childhood development is for children aged 3-6 years) at which they must pay fees, buy a uniform and provide their own stationery equipment. This is impractical for orphaned children who often stay with grandparents who have no income and can barely buy food to sustain the family. After extensive research, initiated by previous volunteer Anja Rackowiak, WEPOGA/MAP has identified 74 vulnerable and orphaned children in the Shibanze area. Shibanze was selected as there are currently no other agencies working here and it is by far one of the poorest and neglected areas within the Butere Mumias district (WEPOGA/MAP) currently only works within the Bungoma,Butere, Mumias District. There are currently 130 children between the ages of 3 and 11 registered at the school and they have, untill now, all been learning in one classroom sitting on the muddy floor. When the school re-opens after christmas there will be a new classroom, kitchen and dinning room and latrines for the children and teachers. This has all been made possible through donations and fundraising events (click here to find out more). Despite the fact that we still have so far to go before the Amani Academy is up to government standards, by providing an alternative, free school we have improved the children's quality of life. Not only are they able to have the chance to gain a basic education (something that many of us take for granted) but we are able to improve the health of the children by providing nutritious, daily porridge, free treatment for minor infections and diseasu es and, most importantly, the opportunity to escape the possibility of child labour. 50 x 50kg bags of cement for the floor (to stop jiggers!) and for the walls @ 700KSh a bag (about US$10), makng a total of 35,000KSH (or about US$492). We also need benches and tables for the dining room. Currently, the children eat there porridge under a tree. Timber for benches and tables is estimated at about 12000KSh (or about US$169). In addition, we need to dig a bore hole for the school and to construct the cubicles for the latrines. 1 x 40ft bore hole will cost 20,000KSh (US$ 282). 1 pump for the bore hole will cost 30,000KSH (about US$423). 10 iron sheets to roof the latrines will cost 5,600KSh (US$79). 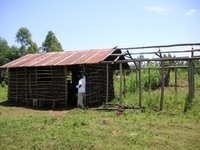 Timber for the latrine buildings will cost about 6000KSh (or US$85). To support all this, we also need regular donations to continue providing the daily nutritional porridge, medical treatment and stationery equipment for the children and teachers. Daily porridge for 120 children for a month (other than this, most children only have a cup of tea in the morning and a simple meal at night, if that) requires a continuous donation of 3200 KSh (about US$44). The porridge is a nutritious compound of locally grown vegetables, including sorghum, soya, maize, amaranthum, etc., and has been proven to boost the immune system. In order to continue to provide regular check-ups and treatment for the children we also need on-going, regular donations. For example, to treat 1 child for worms (ring worm and intestinal worms)cost 295 KSh (about US $4). You can help make all this possible by making a one-off donation through a Swift bank transfer or by sending a cheque (click here to make a donation). As you can see (check out the left hand column) all donations make a big difference no matter how small. One of the biggest problems for farmers here in the Western Province is that they have zero capital to embark on new income generating activities (IGAs) due to years of repression by the Mumias Sugar Company. This means that all the training members receive from WEPOGA\MAP in organic farming can not be put to use as they have no money to buy fertiliser or quality seed stock (fertiliser and sugar cane are provided by sugar companies and the considerable cost is then subtracted from the "profit" the farmers make). In order that we can address this issue, WEPOGA/MAP aims to provide it's farmers with an agro-credit service. The idea behind agro-credit is to be able to give registered groups the tools to start organic farming, and when they make profit from this, they will pay back WEPOGA/MAP at the agreed amount so that WEPOGA/MAP can then do the same for another group, making the agro-credit service self-sustainable. Agro-credit will come in many forms. For example, some groups (like the Namuma self-help group, pictured right) are looking to start an organic dairy project following training in organic animal husbandry. The cost of a good heifer that can produce at least 20 litres of milk a day (sold for 600KSh) is 30,000KSh (about US$424). If this is a project you think you can support please click here to find out how you can make a donation. Another form of agro-credit will be to provide groups like the Lumboka W omen's group (pictured left) with good seed and vine stock for their orgainic farming project. 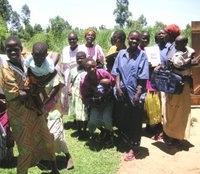 These women (and many like them) have formed a cooperative in order to try and better their situation. They have a very small plot of land each (granted them from their husband's estate) but no capital to make it worthwhile. Having identified profitable markets for organic potatoes and tomatoes we want to be able to help the Lumboka group get this project off the ground. The cost of 4 bags of SPK 004, 005 or 0013 sweet potatoes vines, which is enough for 1 acre, is 800KSh (about US$11). 1 acre will produce 25-40 bags of potatoes and 1 bag alone will sell for 1000-1200KSh (between US$141 and US$169). The cost of 100g of Nuru or Suzana F1 hybrid tomato seeds (enough for 1 acre) is 10,000KSh (about US$141). The potential profit from this however is 150,000KSh! (about US$2,120). If you would like to help these women, or others like them, by donating money for seeds, potato vines and organic fertiliser please click here to find out how. Having educated our members in organic farming and provided them with seeds and fertilisers through our agro-credit service, WEPOGA/MAP then aims to be able to get this produce to more profitable markets identified in Nairobi, Kitale, Kisumu and Kakamega. To do this, we need to buy a vehicle as at the moment the only affordable way to transport goods is by bicycle (some farmers cannot even afford this) and the distance to these markets makes this form of transport impossible. The cost of a suitable vehicle (due to the heavy rains and poor roads this must be a 4x4) is estimated at about 800'000 KSh (just under US $12'000) and would make a huge difference to our members as it would immediately broaden our services and their horizons. If you feel you can make even a small difference and help some of the poorest people in Kenya better their economic and social situation, please give now. Every donation helps!!!!! !